I’m dusting off a series I wrote a few years ago on the numerous servants, staff, and workers on a Regency and Georgian Era estate. I figured it was time to revisit the subject and have fun digging deeper to uncover additional information. Plus, I like history! As many of you know, my Darcy Saga doesn’t strictly remain above stairs and ignore the dozens of people who reside “below stairs” as it were. They deserve respect for their talents and arduous jobs because from the steward down to the lowly scullery maid, great estates like Pemberley or Chatsworth would fall apart without them. Literally! Grand estate servants and staff were divided into inside and outside personnel, and the inside staff divided again into upper and lower levels. Greater the responsibilities and closer the association with the master or mistress of the household, the higher a servant’s standing. A definite hierarchy existed, servants acutely aware of rank and class distinctions amongst themselves. Service to an English estate, particularly for an esteemed aristocrat or respected gentry class family was considered a prime occupation. In a world of harsh working conditions and strict social divides, gainful employment on an estate provided an excellent salary, security, and prestige; a job to be proud of and possibly evolve into a professional career. If one played by the rules and wasn’t afraid of rough work! Estimates based on census results from the first decade of the 1800s say domestic servants (household staff) numbered around 910,000 with some 110,000 being male. From 1775 to 1801, servants accounted for anywhere between 1 in 10 to 1 in 5 persons in the UK. Whatever the exact statistics, the point is that servants accounted for an enormous slice of the working class. Wages were meager, compared to some other jobs, but the perks worth the lower pay. Typically room and board were covered, clothing provided (uniforms and possibly cast-offs), monetary tips for special work or from guests of the house, left-over food, and the social benefit of employment in an upper-class house. Turnover of personnel was far more common than we imagine. Upheavals in the family situations — death, marriage, changes in fortune, etc. — affected the servants, of course. Yet even in a stable household, the long hours, backbreaking labor, and exacting standards led to poor health or injuries and dissatisfaction with the job. The grass may well be greener in another house! Plus, with the majority being female, marriage with resulting children (or just the child without the benefit of a husband, as often happened) further upset the staff roster. As a small aside, it was not forbidden for domestic help to be married. Masters and mistresses established rules as they deemed proper and circumstances varied widely. Excellent domestic help was in high demand. An exceptionally good worker could bargain for a higher salary or seek better employment. Conversely, a poor or untrustworthy worker could be swiftly discarded at the whim of the master. Another willing person could easily be found. Servants were typically discovered via recommendations from friends and relatives. If one’s maid was reliable, and she had a younger sister, viola! Girls routinely took jobs at 12 or 13 years of age. Starting as a scullery maid at that age, with hopes to rise in the ranks, was viewed as a golden opportunity. References written for a worthy servant who may be relocating or simply wish to attain an improved position were not required from the employer, but often given. Servants with experience and special skills — such as a governess, lady’s maid, valet, etc. 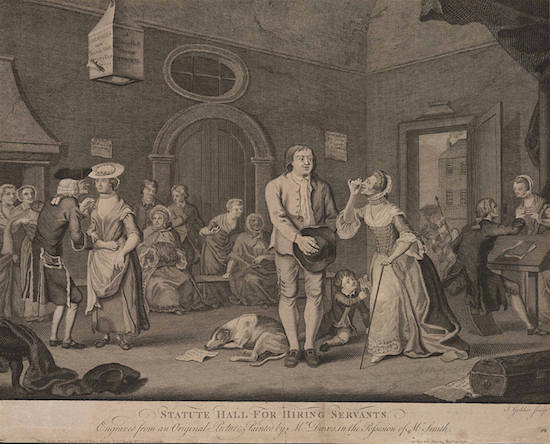 — if unable to secure employment through the preferred methods above, might advertise in a newspaper, but more likely went to one of the “servant registry” offices scattered about where, for a fee, the office proprietors matched clients. These establishments were unregulated during the Regency so not always reliable, but it was another option both for the servant seeking a job and the employer seeking a worker. Training schools for domestic help didn’t exist as we imagine it. However, there were charitable organizations with programs to help young ladies, primarily, such as the snippet below indicates. In other words, better a career as a servant than a career as a prostitute! WINCHESTER FEMALE ASYLUM: 1815 Handbill announcing the opening of an asylum in Canon Street for girls between 13 & 16 to prepare them for their career as servants, with a strong emphasis on moral development. The project – “to rescue many young persons from misery and infamy and make them respectable members of society” – is outlined in detail by the joint matrons. An exceptional domestic could rise to a position of power. The housekeeper and butler, for instance, often began service in a lower capacity. Children of trusted staff were fortunate. For them the prospect of future positions on the estate, references extended by the Master to gain entry into another great house, or the gift of higher education to secure an independent future were major perks and common. Men were prized above females and earned a higher wage. (Go ahead and insert groan or “I am woman, hear me roar!” now) The number of male, liveried servants employed was a symbol of status for the Master; his ability to pay for a large number of men an indication of his wealth and prosperity. Likewise, the quantity and quality of servants employed across the board, male or female, displayed one’s prestige. Grab onto one of those super expensive male French chefs floating around after the Revolution to seriously prove your worth! The precise number of servants necessary for a modest estate to function varied widely. A rapid calculation of the basic requirements easily leads to twenty persons (including the outdoor staff). A larger estate demanded a small army! The running of a grand home in an elegant style, such as Duke of Westminster’s household at Eaton Hall, might require up to fifty servants. Outside of the bare minimums — cook, housekeeper, maid, butler, kitchen maid, groomsman — other positions were optional and roles often combined. Household servants, with the exception of the upper-level employees, would share rooms either in the basement or the attic. These accommodations were spartan, providing basic needs and scant more. If lucky the rooms possessed small casement windows for ventilation from the smoky fires and to provide sunlight and fresh air. Cast off rugs and wall hangings may be allowed to dim the cold seeping through the stone and add the warmth of hominess. How comfortable their lodgings and well fed they were depended on the generosity of their master. I’m sure we all agree the Pemberley staff lived like royalty, right? Many books have been written on this subject, as well as a plethora of website blog posts/articles. I’ll share links as I go along, beginning with the two below. The featured image for this post is the cover of Up and Down Stairs: The History of the Country House Servant by Jeremy Musson. A terrific book, and can be purchased on Amazon in print or digital HERE. There are too many positions to cover along with the general information, so today I will begin and end with the one “servant” who was, in fact, not a servant at all! I’m starting with the Estate or Land Steward (also called “estate agents” although this was rare by the late Georgian period), however this man was not considered a servant in the typical sense. This position was by far the highest ranking and most important for the running of estates during this pastoral era in England. The steward was a professional employee and independent from the rest. Educated, respected, well paid, trusted, and ranked immediately below the Master he served. Squarely in the middle class, the estate steward usually owned a home away from the main house or lived in a separate dwelling on the estate. His duties included complete management issues for the estate itself: hiring and firing of workers, settling tenant disputes, overseeing the harvest and livestock, collecting rents, keeping the financial records, etc. Sometimes called a bailiff in times past, he also dealt with local criminal matters. Very wealthy men with huge estates might hire several stewards (one for the house and one for the estate lands, for instance), and certainly if they owned more than one property each had its own steward. How much control the steward had over an estate depended, naturally, on the landowner. A diligent landowner would be actively involved in the management of his estate and intimately aware of every last detail. Not too surprisingly, this was not always the case! Between men too busy socially or politically, or because they simply wanted to have fun spending their money or lacked intelligence, there are numerous historical instances of untrustworthy, venal stewards robbing from the estate and abusing power. Additionally, stewards were not always allowed to manage as they should. A controlling, arrogant, or not-too-bright landowner could ignore the expert advice of his steward, running an estate into the ground and himself into the poorhouse, and guess who would be blamed? The steward! Right! STEWARD (n) — Old English stiward, stigweard “house guardian, housekeeper,” from stig “hall, pen for cattle, part of a house” (see sty (n.1)) + weard “guard” (see ward (n.)). Used after the Conquest as the equivalent of Old French seneschal (q.v.). Meaning “overseer of workmen” is attested from c. 1300. The sense of “officer on a ship in charge of provisions and meals” is first recorded mid-15c. ; extended to trains 1906. This was the title of a class of high officers of the state in early England and Scotland, hence meaning “one who manages affairs of an estate on behalf of his employer” (late 14c.). That is enough to get started, I think! I’ll be back in the weeks ahead and eventually will talk about ALL the people who maintained the dazzling world for our beloved characters to live in! Fabulous post, thanks so much for all the great information! Thank you. I must say that a Steward sounds like an amazing and busy individual, especially if an estate was large. It sounds like he would have needed quite a good education and an enormous amount of knowledge. It is too bad some snobbier upper class looked down on this important individual. Wonderful post! Thanks, Sharon. So detailed and informative! I found the book in your featured image in a second hand book shop a while ago, it’s a great read. Pamela Sambrook’s too, I absolutely loved them! Not many focus on the Regency period, more’s the pity, the funny anecdotes seem to be either before or after, but very enjoyable still. Looking forward to read about the whole household hierarchy. Oh Sharon, you touched on a subject that I love. Thanks you for beginning this series for I needed to know more about the servants. So Interesting! Thanks Brenda! Glad to help. It’s been a while since I studied up on the servant world. It is very fascinating, I think. Interesting information. Thank you for sharing! Kitchen may not be as fun as you think. LOL! No electric appliances or hot running water, and so many mouths to feed. Yikes!! Thanks for this post Sharon. I do like to read about life in regency times and this shows how vital good servants were especially to large estates like Pemberley. Look forward to the next post. You are welcome, Glynis. Indeed the life our favorite Regency characters lived could not have existed without the massive number of servants. It truly is mind-boggling to imagine how much work they did! Sharon, thank you for this fascinating post! Thank you for sharing. This is very interesting. It’s fun getting to know each servant’s position and duties.